Whether you’ve been gluten free for five years or five days, you know that finding a delicious gluten free biscuit is like finding the perfect Christmas gift for your second cousin. I have been guilty of literally sniffing (almost inhaling) regular biscuits at restaurants because of how much I miss them. Please don’t judge me, I’ve spent four years in a biscuit-less void. So when my sweet grandmother-in-law, “Baba”, sent me biscuit cutters and a Southern Living Cookbook I knew it was time to try to for fluffy, buttery gf biscuits again. And after a weekend of experimentation, I finally found the biscuit recipe my heart desired. Enjoy! *A quick note – if you are a recipe tweaker, I highly suggest NOT changing anything the first time you try this recipe. Biscuit dough is very sensitive and does not respond well to too much handling or change in ingredients. Heat oven to 450 degrees F. Generously grease a baking sheet with butter. Use the butter wrapper to hold the butter while you grate it into a small bowl. Place bowl in freezer. Measure flour into a large bowl using the scoop and sweep method. Whisk in baking powder, salt and baking soda until well combined. Add the cold, grated butter to the mix and combine using a pastry cutter or two knives until the butter is incorporated as pea size chunks (smaller is fine). Pour in cold buttermilk and stir with a wooden spoon until the mixture is just combined. Do not over mix! Transfer your dough to a lightly floured surface and gently form into a rough ball. Gently press and shape the dough until its about 1 inch thick. Cut biscuits with a biscuit cutter. Do not twist as you cut and place each biscuit directly on the buttered baking sheet. 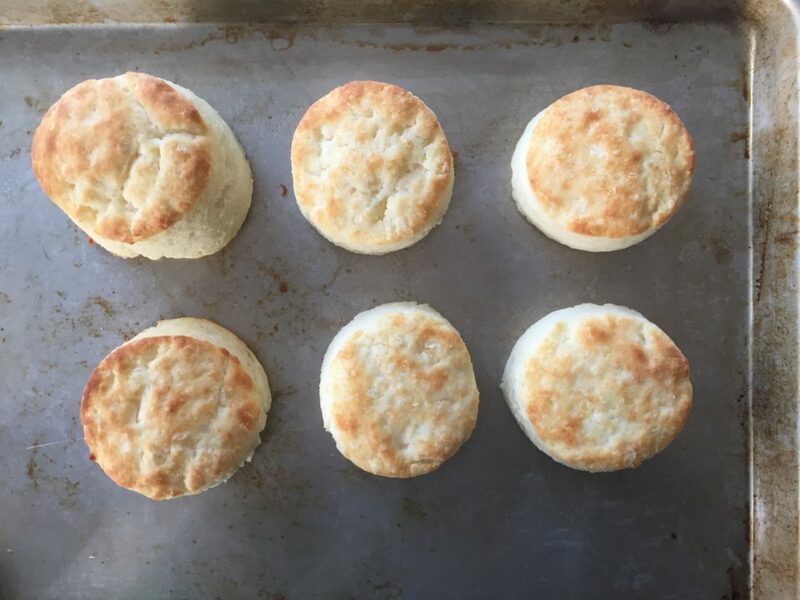 For soft sided biscuits, place the biscuits close together. For crisp sided biscuits, place them 1 inch apart. Place baking sheet in freezer for 8 minutes to re-chill dough. After 8 minutes, transfer the baking sheet directly to the oven and bake biscuits 10 to 12 minutes until golden and fluffy. Serve immediately. And because I care about both your soul and body, here’s one of my favorite running apps. Trust me, once you taste these biscuits you’ll need it. Don’t underestimate the power of a good playlist. It gives people something to talk about, dance to, and covers a lull in conversation. Start the music while you’re preparing dinner, well before your guests arrive. Let yourself jam out to your favorite tunes. It will calm your nerves and bring you out of the awkward zone.